Check out The Wolverine storyboards by Daniel James Cox! 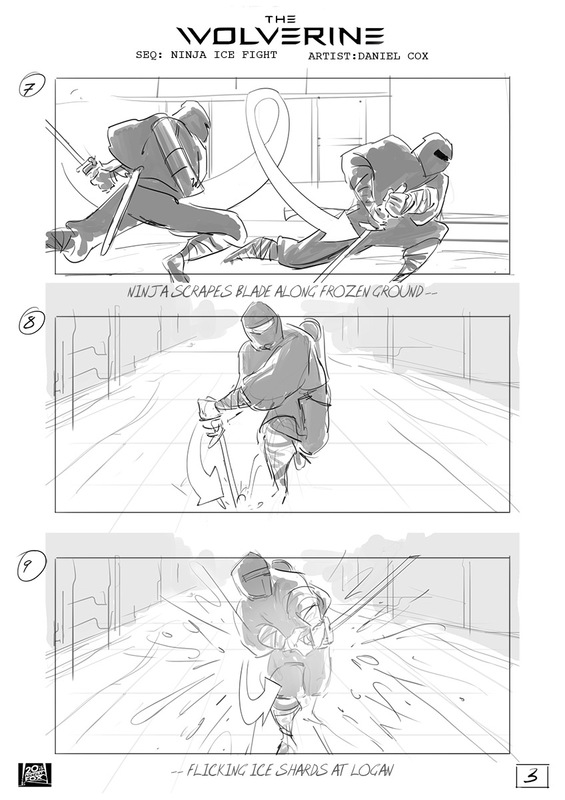 Update: Daniel sent me some more storyboards for the Shingen Death scene! This is the second The Wolverine storyboard interview that I did. Monday, I shared my interview with Wolverine storyboard artist James Coven. Today I'm letting you hear my conversation with Daniel J. Cox. It was Daniel that suggested these interviews when I contacted him about his Fantastic Four designs. They planned a panel at Comic-Con, but couldn't get the studio's approval in time. 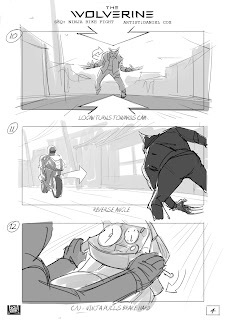 Cox is a professional storyboard artist, who's worked on Hollywood films like The Great Gatsby (2013), Fantastic 4: Rise of the Silver Surfer (2007) and Knowing (2009). 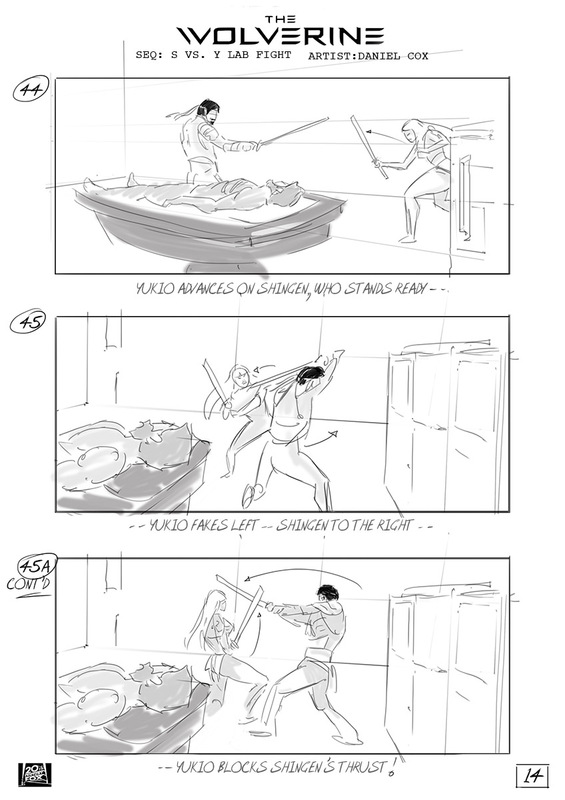 He gives a great interview and shares some storyboards for scenes that never made it into the film. Maurice Mitchell: Thanks for this interview Daniel! 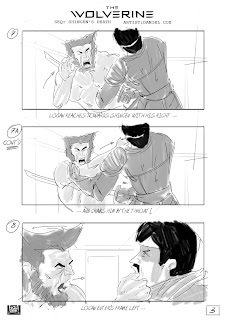 When did you start storyboarding for Wolverine? Daniel J. Cox: I came on the show much, much later than John. 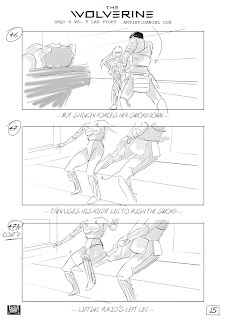 Though when I started at Fox Studios Australia, I thought I was the only board artist working on the picture. It was only after a week or so that I was told John was flying in from LA, which was great as it's always nice to have a colleague that you can bounce ideas off. We were setup in the production office…right near Jim [director James Mangold] and the producers, so they could keep an eye on us (LOL). 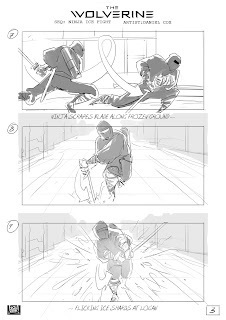 I worked on three main sequences: the ninja ice bike fight (which was cut from the film), the lab fight between Yukio and Shingen, and the end sequence of the climatic fight between Logan and Shingen. I also did a few other bits and pieces for gags that David wanted to pitch. 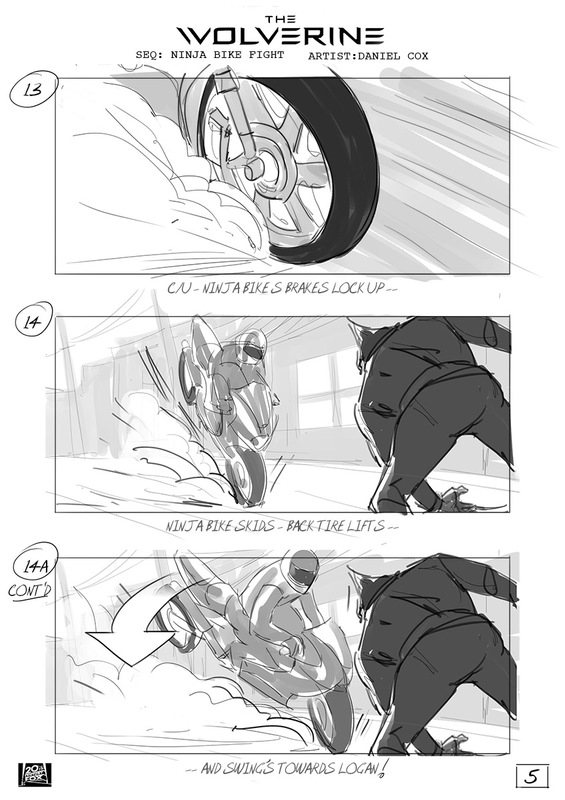 MM: John Coven talked a little bit about a fight between Ninjas on motorcycles. Can you tell us more about that? DC: My first assignment was this sequence! As John said, David Leitch had ideas that he wanted to pitch to Jim and the studio. Dave took me through his ideas, using miniature bikes to explain the moves, and what he wanted to see. He had bikes doing hand brakes and smashing into Logan, doing vertical 360 flips, shooting him with net guns -- all sorts of really cool (but crazy!) stuff. So on my first day I was introduced to David and Jim, and then stood around a table, while they play acted out the scene using toy bikes LOL. He would show me a couple times, then I'd go off and draw them. Great fun! 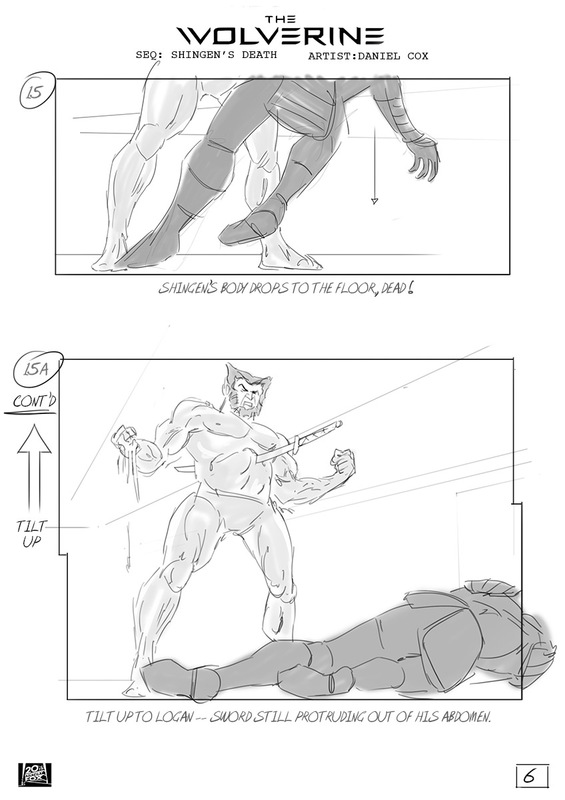 MM: John talked about some leaked Wolverine storyboards from the film. Were you familiar with those boards? DC: As John said, that was stuff which was produced earlier in the production, when they were based in LA. That was a pretty funny day though because Francois, the production designer, had left those up after a presentation to members of Australian government, and by that night, they had leaked onto the web. 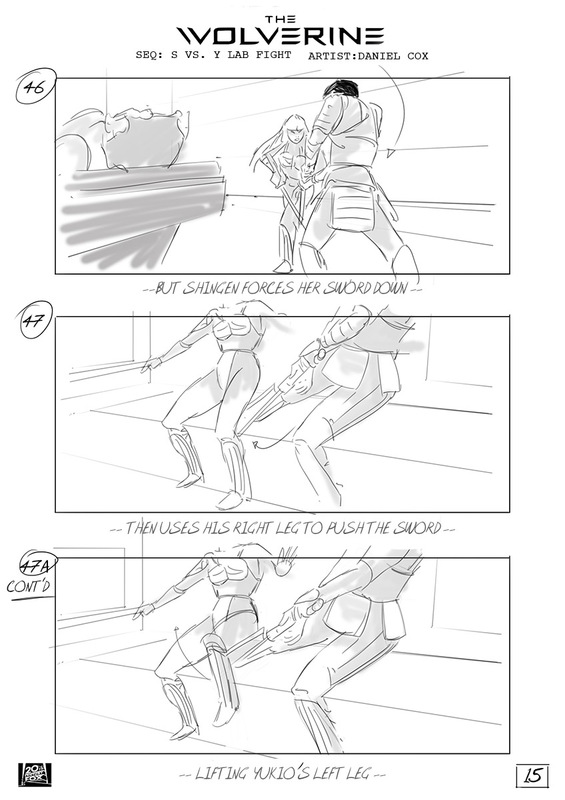 MM: Was there a particular storyboard scene you found the most challenging? How did you overcome it? DC: Really, all the sequences are challenging. Drawing motorbikes is always challenging, and I like to give my boards movement and energy, and sometimes that's hard when you are focused on the shot design. John has much more experience than I do, since he lives in LA and is able to make a living just from storyboarding. While I live and work just in Sydney (and sometimes fly across the ditch to New Zealand for gigs), so I also do production illustration and visual effects art direction. But I learned a lot on this job working with John, David and Jim, so that was invaluable. And of course, every job you do, you get better and better. It's really just about practicing your craft as much as you can! And as they say, if it was easy…everyone would be doing it! MM: It's a challenging job alright. Are there any funny or interesting memories you have from working on the film? First, Jim's awesome…he's a big, solid guy and he walks around in these big boots, and has this booming voice. You know when he's in the room. And he's hysterically funny, and is always making jokes. For instance, Jim was reviewing our boards and John was showing him a sequence that was supposed to take place in Tokyo, but was being filmed in the small Chinese Gardens in Darling Harbour, Sydney. 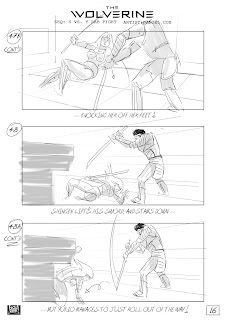 So after seeing about three panels, Jim was like "borrrrrrringggggg". John tried to explain that he was just using the set reference he'd been supplied, and Jim was like "But it's gonna look like Matlock". For those that don't know, Matlock is a tv courtroom drama that ran on NBC in the late 80's, so the exterior shots were mostly stock footage or just lit really badly. It was just Jim's way of saying he wanted the production quality to be really cinematic. But yeah, that cracked me up. The other story I'll share was actually really cool and I felt I was able to make a good contribution to the film. 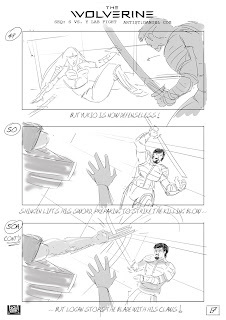 You see, the earlier drafts of the script had Logan stabbing Shingen in his chest during the climatic fight. Now, I'm a big fan of comics…been reading them all my life. And of course, I had my copy of the Claremont/Miller miniseries with me the whole time. Anyway, John and I were chatting and I was adamant that, as a fan boy, the one thing that has to stay is how Logan draws in Shingen with his claws retracted, grabs him…then pops his claws into Shingen's neck. That to me, was one of the best scenes ever drawn in comics, and also really showed Logan's character. It had to be in the movie. So just as I'm explaining this, John goes "well, here's you chance to tell Jim". I turn around, and there's Jim, marching towards us -- "Tell me what?" he booms. I was like, "oh s**t". Gulp. So I explained it to him, and Jim said "We can't do that. I think it's a rating issue". Then he quickly disappeared…and I thought that was that. Then two seconds later he's back with the Fox executive, and Jim tells me to explain it to him. Which I did. Then Jim thought of a way that we could do it without showing the claws entering Shingen's neck, and acted it out for the Fox executive. It was great, and then Jim asked "what's that rated"? And John and I looked at each other and I blurted out "that's rated A for awesome". And we all had a big laugh, and Jim instructed me to board it. 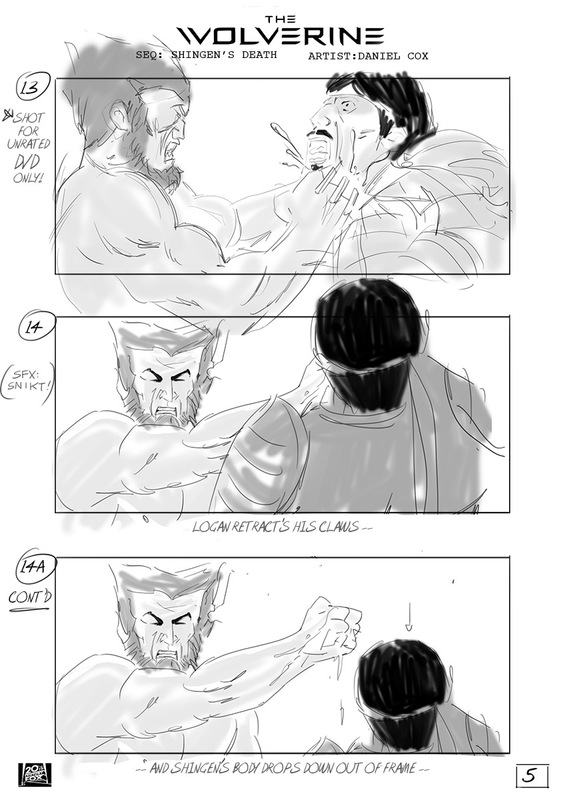 Which was great, and I even added an explicit shot of Logan's claws going into Shingen's neck, which was specifically for the unrated DVD version. Still haven't seen that version yet, so will be very interested to see if it made it in. But yeah, that was a fun time! MM: Hopefully we get some awesome deleted scenes on the blu-ray. Where can we see your work next? DC: I've been doing bits and pieces since finishing The Wolverine. I did some concepts for Greg Mclean's upcoming Wolf Creek 2, which was a lot of fun. Readers -- make sure you go see that…fabulous Aussie outback horror story. But mostly I've been focusing on getting my own animated series up, and a live action horror anthology which I'm getting traction on. Oh, and I'm waiting on the green light to start on Alex Proya's Gods Of Egypt, which has had a few false starts. Hopefully it'll drop soon! That will be fabulous if it gets up! 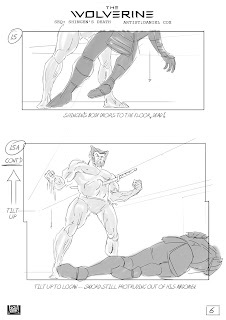 Click on the links if you want to see more of Daniel James Cox' art and The Wolverine on my blog. What do you think of the concept art? If you've seen The Wolverine what did you think? Awesome interview! 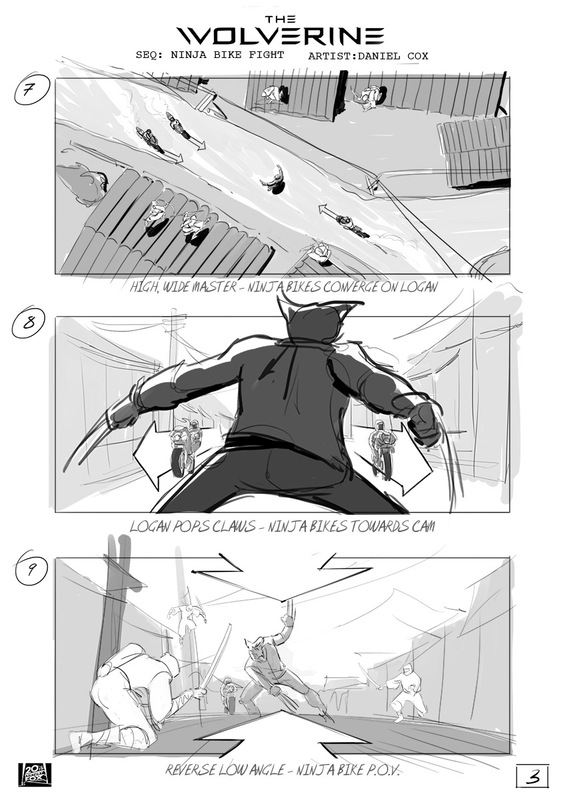 I would have loved to see Logan shred some ninja on ninja bikes! The Lab fight was pretty intense.